What Is an Air Sampling Smoke Detection System? A few years ago, in the Midwest, a healthcare facility with a large data center experienced a smoke event that left them thinking about their fire protection strategy. The data center installation included three IT equipment rooms and one Network Operations Center (NOC). Because of the critical importance of the computing load, the data center was pursuing a better fire protection strategy and exploring how it served their network of locations and providers. They chose to upgrade their smoke detection system with an air sampling smoke detector. The first detector was installed in the NOC to replace the traditional spot-type smoke detectors at the ceiling and, within a few weeks, the detector signaled its first low-level warning of a buildup of smoke in the area. An air sampling smoke detector (ASSD) is one of five ways listed in the National Fire Alarm and Signaling Code to detect smoke. Additionally listed are: spot-type smoke detectors, projected beam-type smoke detectors, duct mounted smoke detectors, and video image smoke detectors. Air sampling detectors use three main components: the detector, which includes the fan and detection chamber, the air sampling pipe (usually ¾” CPVC), and sampling ports, which are holes drilled in the pipe. The fan inside the detector draws air from the protected room into the sampling holes, channeling it back through the pipes and into the detector, where the detection chamber both detects for the presence of smoke and measures the quantity of smoke in the air. Sampling holes at the ceiling level are arranged just as spot-type smoke detectors would be and follow the same spacing rules (refer to NFPA 72-2013 ed., Chapter 17). As smoke is measured from the room, ASSDs are arranged to warn the user of the detection of developing smoke conditions, often giving multiple levels of pre-warning before the room conditions get to the point where the detector sends a signal to the fire alarm control panel. This pre-warning is why air sampling smoke detectors are considered Very Early Warning Fire Detection (see inset for more information). Another unique feature of ASSDs is their ability to discriminate between different particle types in the sampled air. Dust and other non-fire particulates will be in the air being brought back to the detection chamber. ASSDs are built to filter out most of the dust from the air stream, but some dust will make it into the detection chamber. Inside the chamber ASSD detection technology can ignore common dust particles and only measure the smoke that enters the chamber. Very Early Warning Fire Detection installed at the ceiling level of rooms containing information technology or telecommunications equipment. Smoke detection at air handling return grilles. This technique works very well and has caused thousands of facilities to avoid fires that would threaten contents or the operation of the building. Buildings where other smoke detectors have failed. Their flexibility allows them to overcome the trials of many high-challenge smoke detection environments. Rooms where other fire detectors will not work, like magnetic resonance imaging rooms in hospitals. Freezer warehouses and other cold rooms. Rooms with high ceilings including warehouses, atriums, and even manufacturing or industrial spaces where it isn’t feasible to mount other detectors at the ceiling. In most applications one ASSD is installed per room. ASSD manufacturers usually make several different size models with differing nominal room coverages. Manufacturers have detectors rated for room sizes from 1,000 square feet up to 28,000 square feet, but the most popular sizes are 5,000, 8,000, and 20,000. Keep in mind this is nominal sizing based around 900 square feet/detector spacing for the sampling holes and ideal piping conditions. In most cases ASSD gets installed with sampling hole spacing between 125 and 400 square feet/detector so the nominal sizes never are realized. When ASSDs are installed on return air grilles to HVAC units or computer room air conditioners, the hole spacing is dramatically reduced. Most installations for proper performance follow the spacing guidelines in NFPA 76, Standard for the Fire Protection of Telecommunications Facilities, which calls for four square feet per sampling port over the area of the return grille. Usually installers provide sampling holes on a two foot grid in two directions over the face of the grille to meet this requirement. The physical location of the detector in each room should ensure the detector is readily accessible to view the smoke conditions in the room and for easy servicing. Installed on a wall at chest height is a very popular way to install ASSDs. Consulting engineers can be challenged when writing performance specifications for fire detection systems utilizing ASSDs. In many rooms one detector per room and one detector for every four return grilles is a safe way to design, but in larger rooms it may take multiple detectors to provide coverage at the ceiling. When in doubt, air sampling detector manufacturers can often help size the number of detectors required for a room as well as distributors for the manufacturer’s product. Installing contractors of ASSDs must run hydraulic calculations for the installation of the detectors to properly size the sampling holes for the installation and ensure the transport time does not exceed the specification or NFPA 72 requirements. Specifying engineers should ask to see those calculations as part of the submittal process. A fundamental point of air sampling smoke detection is the capability of very early warning of smoke for the personnel operating the facility. The capability of very early warning allows responsible personnel to investigate a smoke condition well before it reaches emergency conditions and triggers the fire alarm system. Special attention should be made each time an ASSD gets installed as to WHO and HOW will personnel be notified of pre-warning notifications from the detectors. Displays from the detectors installed in the facility or even remote display units should be located where personnel can see them and react to pre-warning conditions. Specifying engineers should discuss the facility’s operations with the building owner during design and show remote display locations on the fire alarm plans in rooms where personnel can watch them. ASSD manufacturers have made great improvements in the ability of their newest model detector’s abilities to notify users of smoke conditions. Some of the latest detectors can connect to the internet to send email notifications when pre-warning levels of smoke are reached. Some detectors can notify users via an app on a smartphone or tablet computer. Inspections and Tests should be done in accordance with the National Fire Alarm and Signaling Code. However, ASSDs can vary between manufacturers, so remember to follow the manufacturer’s recommendations included in the operations manual. Inspections should be performed twice a year. Any filters in the system should be verified as clean. The piping for the system should be inspected to make sure the piping and fittings are installed properly, appear to be intact, and are supported properly. Labeling and identification for the piping should also be inspected. Finally, and most importantly, the sampling points should be visually inspected to ensure they are not obstructed. Tests should be performed once a year. There are two tests that are required, an alarm response test, and a transport time test. Each should be performed in accordance with the ASSD manufacturer’s published instructions. The alarm response test is similar to the smoke test performed on spot-type smoke detectors to ensure that the detector transmits an alarm when the proper smoke level is reached in the detection chamber. The transport time test measures the time it takes for smoke to travel from the most remote sampling port and register on the detector. This test ensures that there are no major changes in the air sampling pipe network. Maintenance items include cleaning sampling ports, flushing or vacuuming out the detection network, and replacing the internal filters. Filters should be replaced whenever the detector shows an internal filter fault, the semiannual inspection shows poor condition or at least every two years (follow the manufacturer’s recommendations). ASSD is one of two ways to meet the provision of Very Early Warning Fire Detection as defined in Standard for the Fire Protection of Telecommunications Facilities, NFPA 76. 3.5.5 Standard Fire Detection (SFD) Systems. Systems that use fire detection–initiating devices to achieve certain life safety and property protection in accordance with applicable standards. 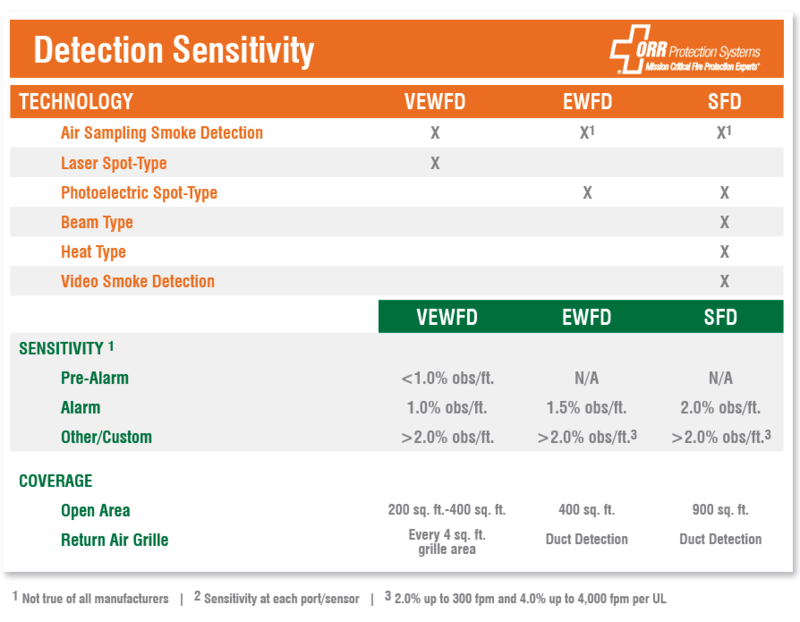 3.5.1 Early Warning Fire Detection (EWFD) Systems. Systems that use smoke, heat, or flame detectors to detect fires before high heat conditions threaten human life or cause significant damage to telecommunications service. 3.5.6 Very Early Warning Fire Detection (VEWFD) Systems. Systems that detect low-energy fires before the fire conditions threaten telecommunications service. These definitions within NFPA 76 are often borrowed for may other building types and help the general understanding that ASSDs are used for very early warning fire detection. In this case, why did the data center choose to upgrade their fire protection strategy? Air sampling smoke detectors are not new, and the data center had heard about the technology for several years. They decided to test an installation of a few detectors to see how they worked. In fact, when they were warned of their first smoke event they didn’t believe the detector was working correctly. The detector was working correctly and helped pick up a smoke event. Before their upgrade they would have never understood they had smoke in their data center when the “thermal event” was that small. 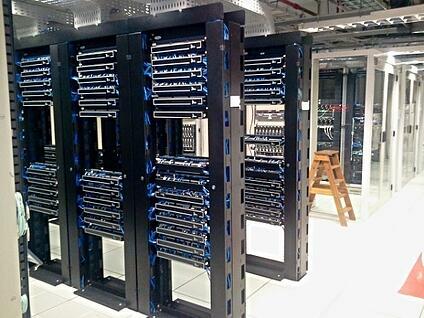 After the data center found the overheated circuit boards using ASSD they decided to install ASSD throughout their data center in all the associated rooms. Their expectations were exceeded from the test case and they were made believers in the technology. Air sampling smoke detectors can be part of an aggressive fire protection strategy where very early warning of a fire event is critical to business continuity. If you would like to know more about air sampling smoke detectors, please visit our information page here.